See Mark's Author Page of Books at Amazon. FSBO’s are remnants of banking cultures that demanded a customer “come to see us” for services, rather than today’s reality of “how can we serve you.” For decades, traditional FSBO’s failed to adapt to consumer behaviors and technological advances, which rendered their business models and service approaches obsolete. As a new generation of startups (e.g., FinTech) rise to serve all market segments—affluent, underbanked, Millennials, Gen X & Y—those dogmatic financial brands hiding behind regulators and protectionist barriers will fail. Yet, gratuitous technology deployment won’t singularly solve FSBO’s core challenges as they wrestle with consumers and regulators. 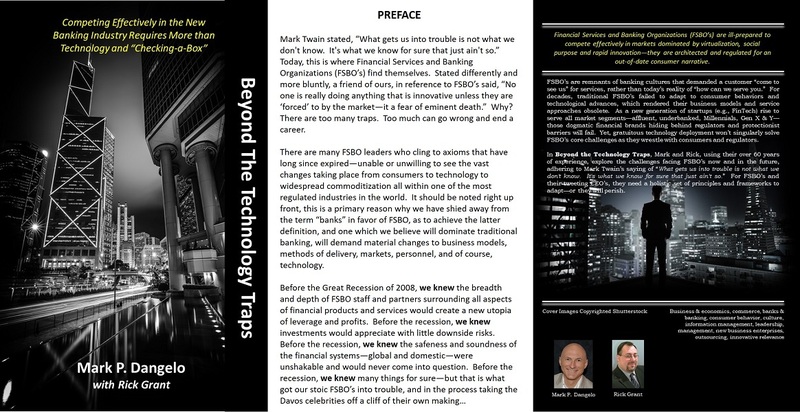 In Beyond the Technology Traps, Mark and Rick, using their over 60 years of experience, explore the challenges facing FSBO’s now and in the future, adhering to Mark Twain’s saying of “What gets us into trouble is not what we don't know. It's what we know for sure that just ain't so.” For FSBO’s and their tweeting CEO’s, they need a holistic set of principles and frameworks to adapt—or they will perish. Without relevance, many an approach or set of facts will suffice. Our organization’s look for successes and advantages onshore, offshore and in fact, “anyshore.” We try to keep pace with our competitors, blaze a new trail, or restructure the enterprise for profitability, but our innovations are fraught with disillusionment, poor economics, or a work force that fails to grasp its importance. Relevance comes from the application of innovation. Innovative Relevance provides a methodical and pragmatic approach for realigning any sized organization. Its processes and approaches provide the foundation for corporate realignments, mergers and acquisitions, and restructurings to maximize profitability and applicability. Protectionism aside, the challenge for domestic workforces is one of relevance and the ability to adopt innovative changes. We have failed – our organization, our staff, and ourselves. Our organizational ability to take advantage of change has been replaced with popular management philosophies of the month. Corporate and investor needs for profits are being met with painful cost cutting and a blind adoption of outsourcing. We’ve lost our innovative abilities. Innovative Relevance recognizes globalization of workforces and the customer’s mandates. Relevance starts with a definitive baseline, sound ethical conduct, and integrated processes for achievement of an innovative “To-Be” operating model with clear metrics and economics. With iterative based migration efforts, committed workforces, and an auditable repository to meet regulatory requirements, Innovative Relevance represents the pragmatic prescription for globalized workforces and operations. Every M&A deal is unique. With escalating expectations and demands from investors and analysts, the necessity for post-deal success has never been greater. However, with historical post-deal integration failures exceeding 60%, there needs to be a roadmap that goes beyond the conventional plans. This second book in the trademarked Innovative Relevance series represents a proven, non-traditional approach for M&A teams seeking post-deal implementation success. Incorporated with the book’s in-depth guidance and recommendations are concise, graphical illustrations, which provide for efficient content assimilation. The use of Innovative Relevance within the M&A efforts addresses the ten most common mistakes made by integration teams. It offers positive actions for the complexities of team politics and emotions, synergy decomposition, n-dimensional data amalgamation, investor activism, and today’s digital challenges of privacy, security, and compliance. Digital Yin and Yang—the darkness and the light. Some describe this as striking a balance of duality between complimentary forces. Similarly in a world now encompassed by enormous data output and precision decision making, there are emerging taxonomies or disciplines which are balanced by privacy versus profitability, marketing versus identification, protection versus accessibility, accountability versus irresponsibility, and fraud versus ethics (i.e., digital integrity). When these discrete continuums (along with others) are assembled, they conjure a “picture” of how particular digitally driven enterprises operate utilizing a cultural profile to achieve results and repeatability. Simple enough, no? No. 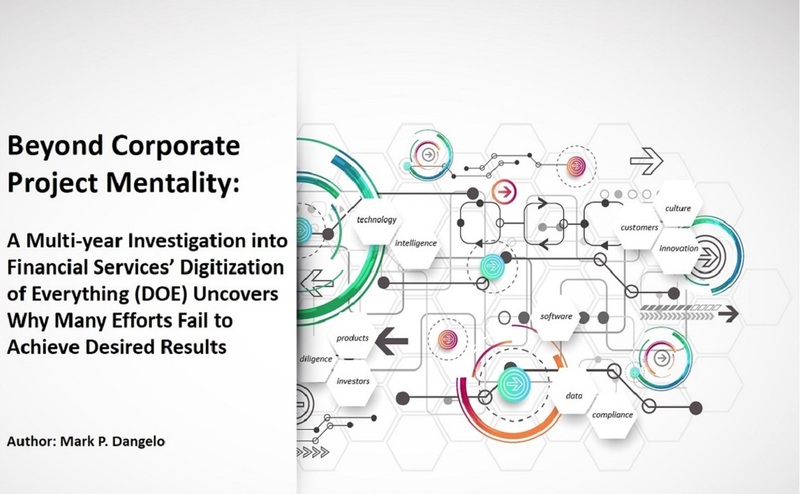 With the speed of digitization, nothing is as it appears and its complexity (along with hidden implications) are anything but straightforward especially for organizations unaccustomed to rapid change. The light-speed of digitization is anything but BAU. Yet, it is the assembly of this puzzle of these complimentary and competing attributes that make digital adoption (and subsequent adaptation) so difficult especially within highly regulated industries such as financial services. Underpinning this evolving digital picture are the realities of organizational capability, acceptance and readiness—aka its culture and complexity of interworking. Since early 2013, I've embarked on a professional journey trying to ascertain what is the secret sauce for digitization success and longevity? For nearly three years, I’ve assembled hundreds of artifacts and thousands of pages of published research, case studies, and recommendations spanning academics, consultants, vendors and thought leaders. However, as I attempted to assemble a common go-forward rationale, I realized that few ideas fit together and little of the solutions spanned more than a narrow range of applicability, or were just a macro blanket encompassing digitization inevitability. Additionally, I believe and contrary to current tenets, that digitization may plant the seeds for the next great “depressional” shift as cross-domain workforces, consumers, investors, corporations, data and of course, technology permanently transform trade, purchasing, supply chains, and an ability to repay (or participate) in any economic interchanges. Digitization, the very thing that makes processes faster, data increasingly accurate and pointed, and consumers clamoring for more, could provide the accessibility for foreign wars, cyber terrorism and unintended consequences that cannot be solved with central banker’s “extraordinary powers”. With a decade nearly gone since the start of the Great Recession and ensuing financial meltdowns, could we fathom how fast economic collapse would come with the hybrid cloud solutions, data gathering, system interconnectedness, and consumer power available with just mobile devices?